16. In contrast, we continue to grieve over the life of The Episcopal Church USA (TEC) and the Anglican Church of Canada and all those churches that have rejected the Way of the Lord as expressed in Holy Scripture. The recent action of TEC in the election and intended consecration of Mary Glasspool, a partnered lesbian, as a bishop in Los Angeles, has demonstrated, yet again, a total disregard for the mind of the Communion. These churches continue in their defiance as they set themselves on a course that contradicts the plain teaching of the Holy Scriptures on matters so fundamental that they affect the very salvation of those involved. Such actions violate the integrity of the Gospel, the Communion and our Christian witness to the rest of the world. In the face of this we dare not remain silent and must respond with appropriate action. 17. 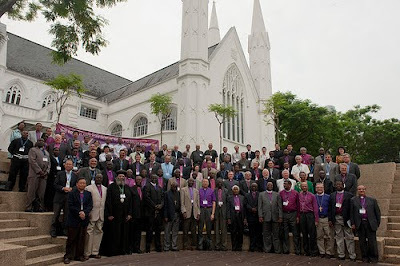 We uphold the courageous actions taken by Archbishops Mouneer Anis (Jerusalem and the Middle East), Henry Orombi (Uganda) and Ian Ernest (Indian Ocean) and are encouraged by their decision not to participate in meetings of the various Instruments of Communion at which representatives of The Episcopal Church USA and the Anglican Church of Canada are present. We understand their actions to be in protest of the failure to correct the ongoing crisis situation. 18. Some of our Provinces are already in a state of broken and impaired Communion with The Episcopal Church USA and the Anglican Church of Canada. Their continued refusal to honor the many requests  made of them by the various meetings of the Primates throughout the Windsor Process have brought discredit to our witness and we urge the Archbishop of Canterbury to implement the recommended actions. In light of the above, this Fourth South-to-South Encounter encourages our various Provinces to reconsider their communion relationships with The Episcopal Church USA and the Anglican Church of Canada until it becomes clear that there is genuine repentance. Mega Thanks to AnglicanTV. Please give generously to AnglicanTV. Learn more here. This and $5 will get you a cup of coffee at Starbucks. Let he who has ears, let them hear. Or as Dylan said, how many ears must one man have until he can hear the people cry? The talks by +Anis and +Kolini are excellent. AnglicanTV continues to bring us wonderful treats. The spiritual impact of this Encounter will have weight in many ways the years to come. "This" is so much better than a cup of joe - even Starbucks. It's "courageous" to not show up? That is simply laugh out loud preposterous. I'm going to courageously not go to church ever again at Truro. That'll show'em. Why should they continue to show up? What has it accomplished? Obviously, the political game is an endrun around them. Time has come to stop playing the game...or doing the same thing over and over again expecting different results. Why are you so angry? Them not playing the game means a different result that threatens you? I wish that people would stop yammering about "the mind of the communion." Scripture is the standard, not popularity of a given idea. I can't believe that these people fell for another stalking horse, again. For about the 20th time. Pathetic.